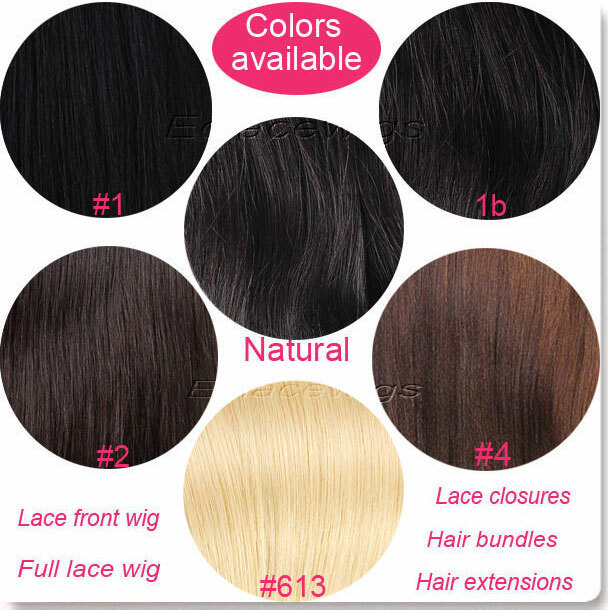 How To Choose Color When Buy Full Lace Wig Or Lace Front Wig? Do you feel difficult to determine color when you plan to buy full lace wig or lace front wig from shop or online website? Maybe you will consider to dye your new wig when you apply it on head, maybe you want to have some gray showing, maybe you want something other looking. But where to begin? Do you pick up one of those boxes from the hair salon or pay someone to do it? We'll tell you how to select the right color when you plan to buy full lace wig or lace front wig and what you should consider. While we don't always give them a lot of thought, hair color and skin tone are two features that work best when you determine your wig color. When these two don't complement each other the way they should, skin may come across as having stark features or looking washed out. Knowing how to match these two features together will help you achieve a harmonious look. 1)Check your skin for its tone. Most people with naturally black or very dark brown hair and have cool skin tones. Most people with naturally red, golden brown of strawberry blonde hair have warm skin tones. Cool skin tones have a pinkish hue while warm skin tones will have a more yellow hue. The easiest way to do this is to check the color of the veins on your wrist in natural light. If they appear greenish in color, then your skin tone is warm; if they are more blue, then your skin tone is cool. 2)Choose a hair color that enhances your cool skin tone. For those with cool skin tones, you need to select human hair wigs with colors that work with cool tones, according to The Hairstyler. Base colors that work with cool skin tones are blonde, brown or red with wheat, honey or taupe highlights. Highlights should always warm up any red or blue tints on the face. 3)Select a color to work with your warm skin tone. For those with warm, or golden, skin tones, a base color of dark golden browns, chestnut or auburn with highlights of red, cinnamon or copper are good combinations. 4)Choose full lace wig and lace front wig hair color wisely if you have ruddy skin. Ruddy appears reddish or pink, and if you have ruddy skin, you should avoid reddish tones in your hair as well as using too much bleach. Go for honey brown, golden or beige colors instead, as these colors soften the coolness of the skin tone rather than being in contrast to it. 5)Please consider if your full lace wig or lace front wig hair color is suitable to match your cloths and anywhere you always stay.